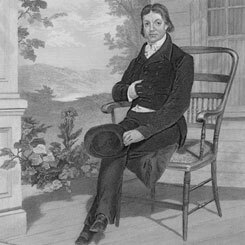 Image courtesy of Library of Congress John Randolph served as chairman of the Ways and Means Committee from 1801 to 1807. On this date, President Thomas Jefferson approved and signed an act to pay France $11 million dollars for the Louisiana Purchase. The House discussed and approved the payment with a 90 to 25 vote on October 25, 1803. During the deliberations, some Members questioned the constitutionality of increasing the size of the nation and Congress’s role in that process. President Jefferson conducted most of the negotiating with Napoleonic France without congressional input. John Randolph of Virginia, chairman of the Ways and Means Committee, asked rhetorically, “Does not the President . . . submit this subject to Congress for their sanction? Does he not recognize the principle . . . that no treaty is binding until we pass the laws for executing it?” The Louisiana Purchase added 828,000 square miles to the United States, stretching northwest from New Orleans to present-day Montana. Daniel Clark of the Orleans Territory became the first delegate from the acquired land in the 9th Congress (1805–1807).